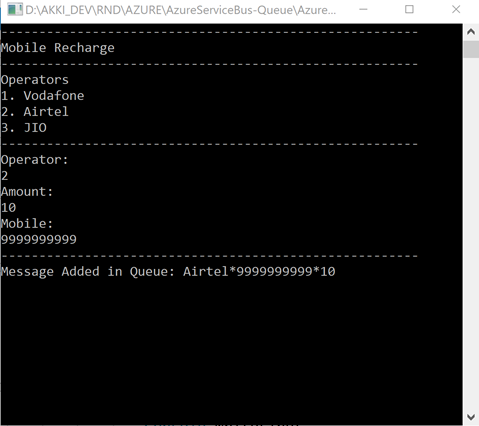 This article explains the real-world business requirement and how Azure Service Bus Queue helps to fulfill it. 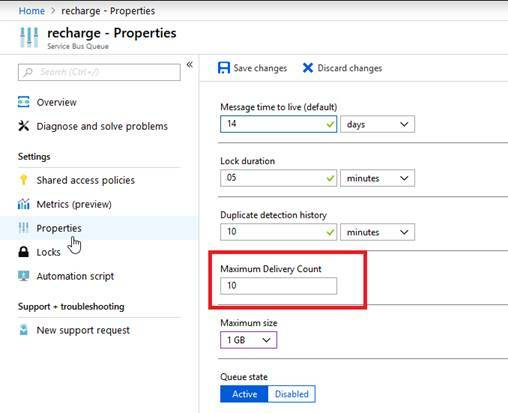 This article explains a real-world business requirement and how Azure Service Bus Queue helps to fulfill the requirement. One of the utility bill payments company wants to build an application, which will do the mobile recharge for end users. The application should support all the operators which are available in the market. 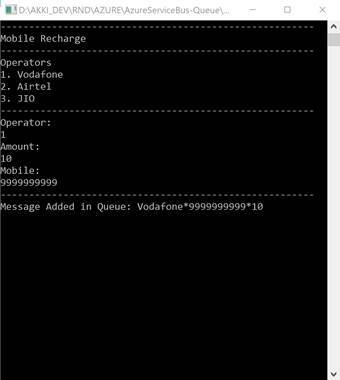 The flow is, the user sends SMS in predefined format and application should parse the message and do the recharge accordingly. Now, the biggest challenge is the application gets a huge number of recharge requests during the peak hours and is not able to process each request, so the company is looking for something like where all the requests are parked when they come and process one by one. 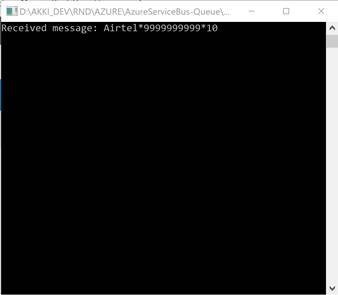 The company came to know about the Azure Service Bus provided by Azure, so he started exploring Azure Service Bus. 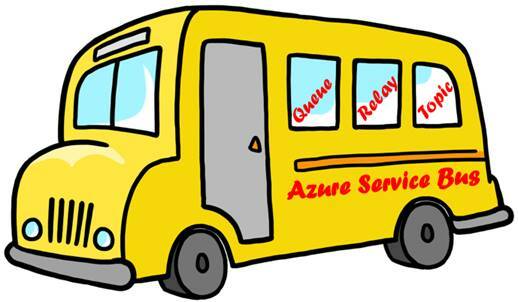 Azure Service Bus supports cloud-based message-oriented middleware technologies like Queue, Topic, and Relay. Here in order to meet the business requirement, we will use the queue mechanism where all the requests will be added in the queue and another side queue listener will process the message by reading from the queue. 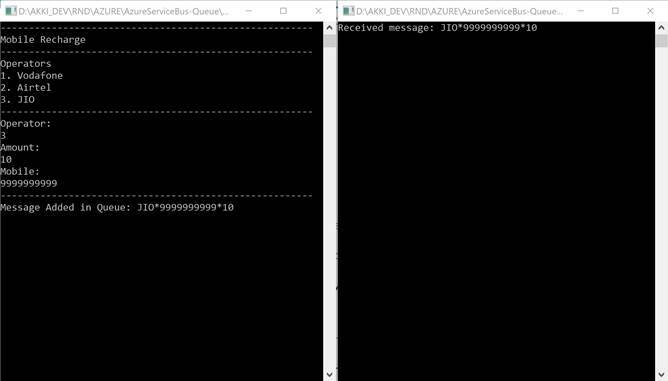 The sender sends the message, adds it into the queue and the receiver processes the message in a FIFO (First In First Out) manner. 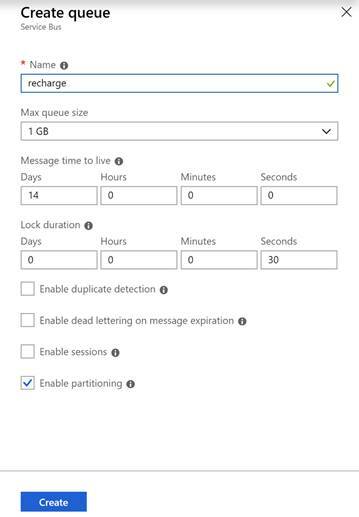 The benefit of using queue is, it creates decoupling between sender and receiver, means sender and receiver should not be available at the same time while sending the message as messages are stored in a queue. Another benefit is load leveling, which means sender sends messages at a different rate and the receiver can process messages at a different rate, as both are independent in sending and processing. Service bus namespace is a container for all messaging components. One namespace contains multiple queues and topics. 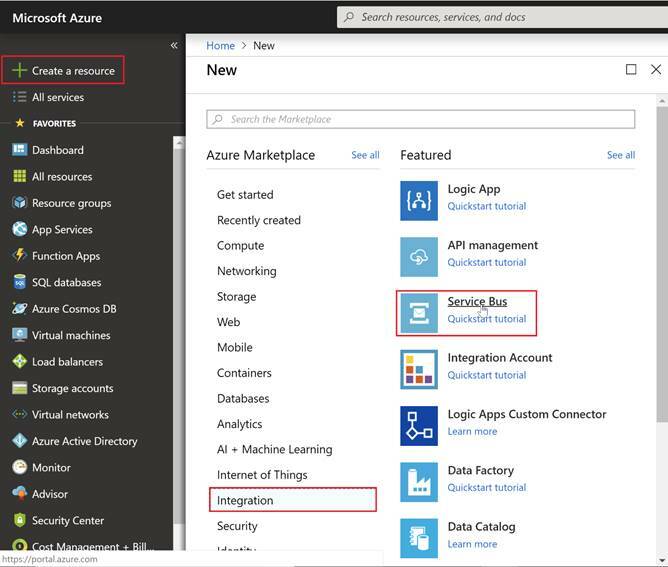 Click on 'Create a resource' from the left navigation pane, click on 'Integration' and then 'Service Bus'. Once you create a namespace, you can explore the same from the dashboard where you can find all the details which you have provided while creating a namespace. Click on 'Queues' on the left pane and click on '+Queue' to create new Queue. Enter queue name and click on 'Create' button keeping the rest of the input as it is. Click on 'Queues' and you will get a list of created queues. You can also find our recently created queue; i.e. recharge. 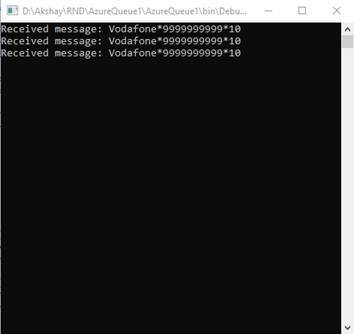 Using queue client, call SendAsync method to add a message in the queue. 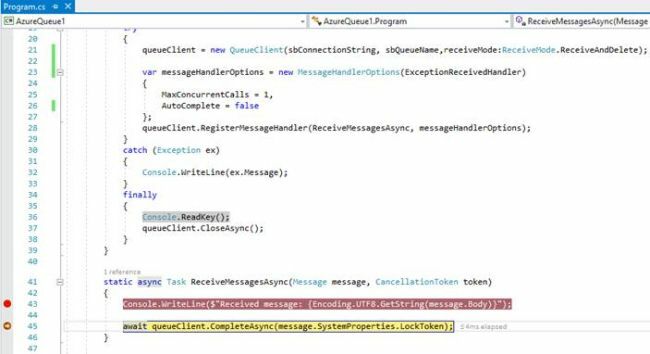 Using queue client, call RegisterMessageHandler which is used to receive messages continuously from the entity. 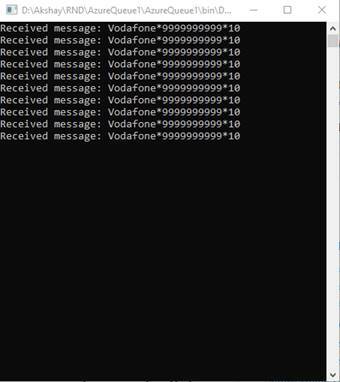 Registers a message handler and begins a new thread to receive messages. This handler has waited every time a new message is received by the receiver. Run the application and you can see the previously added message in the queue. Check the queue once again in the portal and you can see the 'Active message count' as zero(0) as it was deleted by CompleteAsync. Now let's tweak the requirement, where we want to do recharge after a specific time, not now. So for this, we have scheduled message facility where you can schedule a message for a specific time. In the demo, we will set it after 5 minutes. In order to implement this, we need to comment SendSync method and call ScheduleMessageAsync which expects a message and schedule time. We can observe in the portal that the message is not added in the queue as 'Active message count' is zero (0) only. Now wait for 5 minutes and verify once again in a portal. We can see that it's added as 5 minutes have passed. Run the read application and you can get the scheduled message. In the next step after receiving the message, you need to process that message; i.e. need to do a recharge. Now assume that while processing the message some exception occurs, then we may lose the request completely. For this situation, we have a Receive Mode facility. In this mode, the message won't be deleted until you call CompleteAsync method, so while processing if any exception occurs, we don't lose the message. Run both the applications simultaneously in debug mode. Provide the required input, and read application shows the added message. Let's check the message in the portal, ideally, it was read by read application, so it should not be there in the portal but as Receive Mode is Peeklock, the message will be there. Execute CompleAsync method after processing the message. We can see in the portal that the message is not available as we have already called CompleteAsync. In Receive and Delete mode, as soon as the message is read, it will be deleted from the queue. Run both applications simultaneously in debug mode. Provide the required input and read application shows the added message. Don't execute CompleAsync method, just hold the debug point there only. Now, verify the message in the portal, ideally, CompleAsync is not called, so the message should be there but as we set ReceiveAndDelete mode, the message is deleted as soon as it was read. Now in your application, whenever an exception occurs during processing you want to reprocess the message again. For this, we have the facility of AbandonAsync. AbandonAsync abandons a Message using a lock token, this will make the message available again for processing. To verify this we need to throw an exception explicitly from ReceiveMessageAsync and from the catch block call AbandonAsync method. Run the application once again and from the read application we can observe that the same message was read 10 times, this means whenever an exception occurs it was available once again to process. You can configure the reprocess count from properties by setting Maximum Delivery Count. Previously it was read 10 times because, by default, Maximum Delivery Count is set to 10. Once the 10-time process is over, it is no longer available in the queue, and it will be added in the Dead-letter queue. We can verify the same thing in the portal. Run the application and it will read all messages available in Dead-letter queue. We don't find any messages in Dead-letter queue now. 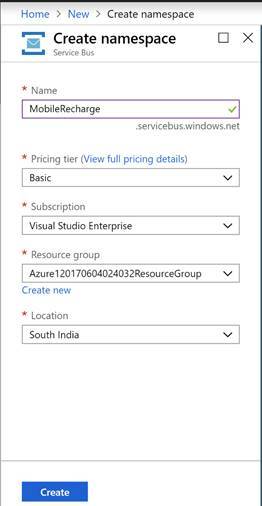 In the next article, we will discuss Azure Service Bus - Topic. You can download the complete sample code from here.